THERE ARE MILLIONS OF CHARITABLE ORGANISATIONS ALL OVER THE WORLD. HOWEVER, THIS MONTH WE HAVE CHOSEN TO HIGHLIGHT TWO VERY DIFFERENT NON-PROFIT GROUPS THAT MAKE A WORLD OF DIFFERENCE. 3 continents, one goal: to fight poverty and injustice. The name OXFAM comes from the Oxford Committee for Famine Relief, which was founded in 1942. During WWII, they sent food to starving women and children. After the war, they opened up second-hand shops. People donated to these shops by giving items such as false teeth and stuffed animals. OXFAM is known throughout the world and many celebrities (including the former members of the Beatles) support them publicly. The latest issue of Hot English (171 – the August issue) is out now! Learn over 300 useful words and expressions and improve your listening skills with Learn Hot English! 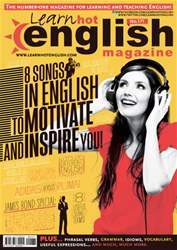 This month: 8 songs to motivate you to learn in English – learn English by listening to these fantastic songs... and get motivated to learn even more! Plus, 6 useful verbs for talking about transport, 8 useful sports words, 12 words and expressions for talking about the cinema, 6 ways for describing time, 8 useful phrasal verbs, 8 idioms... plus: • Unusual news – home wreckers. • Health – losing weight with Richard Simmons. • Phone English – making reservations. • Language – confusing words. • TV – Frasier. • Business – Adidas versus Puma. • Food – casserole. • Culture – charities. • Film – 007. • Philosophy – good versus evil. • Celebrities – memorabilia sales. • Language – the meaning of “wicked”. • Slang – learn some slang with our dictionary of slang. AND LOTS, LOTS MORE! By reading and listening to all this great content, you'll improve your English reading and listening skills and learn up to 300 useful words or expressions. Plus, you'll get a better job and pass English-language exams more easily. Guaranteed! It’s a Bird, It’s a plane!